Durable and unique Heavy Duty Self-inking Date Stamp with chagable Message. Shiny Heavy Metal Daters have a long shelf life. They are made mostly out of metal for strong construction that stands up to industrial and heavy office use. TESTED, INSPECTED, POSTED, ATTENTION, FAXED, RECEIVED, SHIPPED, BY_________. This stamp has a ribbed die plate surrounding the date stamp window, and each one of the above messages comes on its own piece of rubber with a ribbed back. The ribbed backing fits onto the ribbed face of the die plate. To change the message, just remove the word from the ribbed base and insert the new message. This unique and versatile stamp is also an eco-friendly product. Plastic components are minimized (most is recycled PET), and metal is maximized. 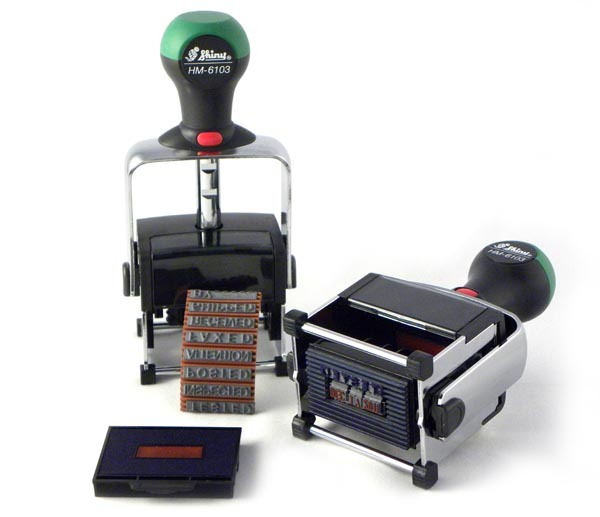 Note: The grooves on this stamp are NOT compatible with traditional RIBtype® rubber type.